Ashwin Thakkar – based in Toronto, Canada is a Senior Sales Manager at Aquatech International. 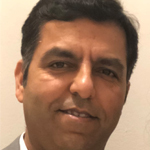 Mr. Thakkar has been with Aquatech for ~10 years and has over 20 years of experience in the water industry serving various areas of Applications Engineering, Sales and Business Development. Ashwin holds a Mechanical Engineering Degree from Gujarat University, India and a Post Graduate Diploma in Business Management from India.